Dry roast coriander and red chillies and make powder. Heat oil,add mustard,channa dal and curry leaves.Fry channa dal till light brown in colour. Add coriander and red chilly powder,saute for a minute.Then add sesame seed powder. Saute for another minute.Then lastly add cooked rice and combine well. Serve hot with any side dish of your choice or just with a papad. My favourite, i can have this sesame rice everyday,love it that much..Excellent dish.. It is lunch tile here and i am really hungry. Aromatic rice.. looks inviting dear.. lovely click!! 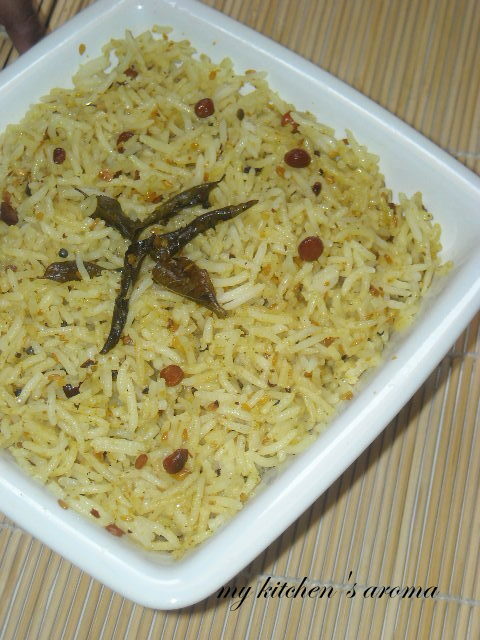 Simple yet very tasty rice preparation. This is my favorite rice! I'd really love to have it with papads! I love this when they give as prasad in temples. I have never made it at home. wow! Nice blog! i stay in dubai too. Do visit my blog if u get a chance, well! It has nothing to do with cooking though! This is my favorite rice when there is nothing else I like. I always have sesaame powder ready at home. Thankyou for dropping by simply.food.Your visits and comments are very much appreciated. Love this rice. Long time since I made. Yours look so tempting Saritha. Loved it.